Nolan "Dude" Northcutt has been in the Woodbury Lions Club over 55 years. On Sunday, March 20th he turns 97 years old. 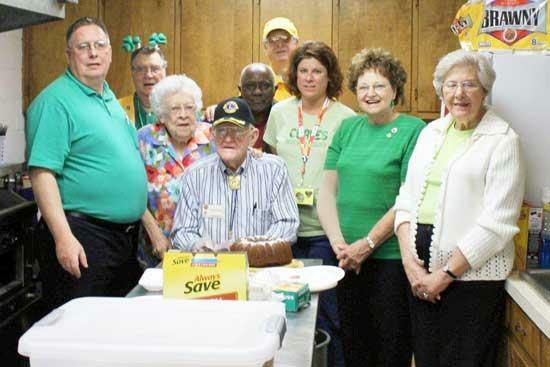 Over the last several years the March American Red Cross Blood Drive hosted by the Woodbury Lions Club falls close to his birthday and Lion Pasty Hirlston has made him a cake for the last 5 years to celebrate his birthday at the blood drive. In "Dude's" 55 years plus, he has been a solid figure at all the blood drives and pancake breakfasts that the Lions Club has had. The Lions Club wishes Dude a very happy birthday and hopes we will celebrate many more with us. Congratulations and Happy Bithday Mr. Northcutt! I hope to see you at Church for many, many more years to come! Dude joined the Woodbury Lions Club in March, 1949 and has attended every meeting of the club except when unable to because of health or business, for 58 years. He is not only the oldest member of the club in years, but in years of service. At the age of about 14, Mr. "Dude" pulled my mom's care out of a ditch (I was the driver and it was legal then!) and let me pay the $6 fee over "time" as I saved a dollar occasionally to pay him. That way I didn't have to tell Mom! Now "Miss Bessie" knows! He has always been a Woodbury institution!